A team of volunteers from America is coming to Staffordshire next month (JUNE) to work in the community and stage free family fun events. The 60-strong choir from Shades Mountain Baptist Church in Alabama will join forces with members of CreateChurch:Cannock and Stafford’s Rising Brook Baptist Church to revamp Cannock’s cinema and help families with light DIY or gardening projects. At the end of the week-long event, dubbed Beautiful Things, there will be free family fun activities in Stafford and Cannock. The team will spend Wednesday, June 12, working in the Electric Palace Picture House in Cannock, replacing seats, painting walls and tiling toilet facilities. They will then move on to the Bevan Lee estate in Cannock where they will help households with activities such as gardening, painting and cleaning. Flyers will be distributed to the estate beforehand and people can opt in to receive assistance if they wish. The choir will also be visiting primary schools in Cannock and Hednesford to teach the children songs which will be performed at the fun day on Saturday, June 15, when families can take part in free activities such as face painting, bouncy castle and a football cage, as well as enjoying a free American-style barbecue. Sponsored by solicitors Pickering and Butters, who have offices in Stafford and Rugeley, the fun day will take place at the Signpost Centre, Highfields, Stafford, from 10am to 1pm, and at Cannock Park from 3pm to 6pm. All are welcome. The Staffordshire churches became partners with Shades Mountain Baptist Church thanks to Alabama couple Richie and Denise Bruce, who live in Stafford and attend CreateChurch:Cannock. CreateChurch:Cannock is a friendly new church meeting every Sunday from 10am at the Electric Palace Picture House in Cannock. See www.createchurchcannock.co.uk for more information. Contact me for any further information. I wrote about Stafford Castle as part of the March 2008 Stafford, Stone and Eccleshall county special for Staffordshire County Magazine. If ever a marauding army decided to attack Staffordshire, perhaps via the M6 motorway, visitors to Stafford Castle would have a good chance of spotting them first. View a PDF of the Stafford Castle feature, History on a Hilltop, here. 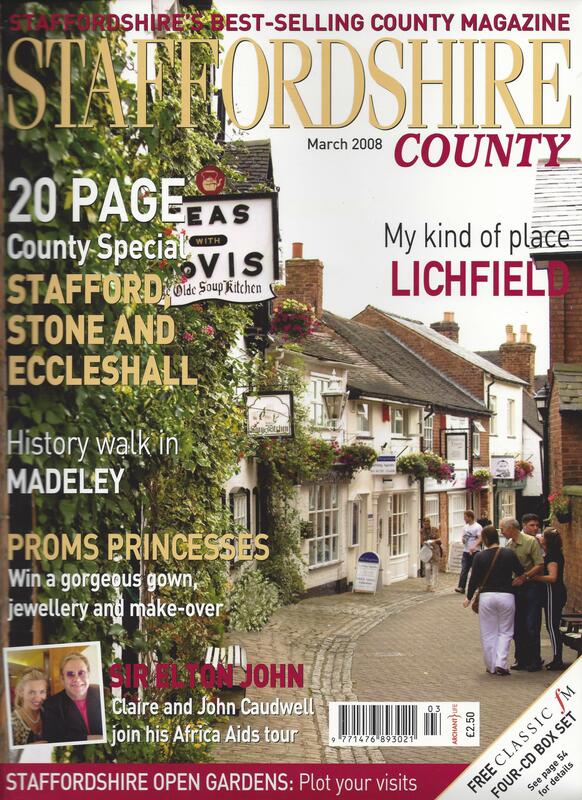 I wrote a pull-out about Stafford, Stone and Eccleshall for the March 2008 edition of Staffordshire County Magazine. This included a range of features, listings and a guide to the towns. View a PDF of the Stafford, Stone and Eccleshall guide, The Golden Triangle, here.